White adult cat sharing Saba’s home. Quick update: It’s now 12.05am, 23 Jan, and we’re just back from another trapping session, and unlike the last round where we targetted Area2 and ended up with 2 Area1 kitties and 1 marauding male, we went to Area2 and got 5 Area2 kitties! Aside from the torbie calico female kitten, Brielle who remains at large, and the short-tailed agouti who’s been missing since mid Dec, the dilute calico family comprising Mum-Brina, short-tailed and small-sized black kitten with white mittens-Brayden, 2 cream-coloured tabbies-Brenna (long-tail female) and Brennan (short-tail male), are slated for mojo freedom tomorrow. We also got a new adult male Jerry, whose gentle and sweet nature belies his experience. He is sterilised but ear’s untipped, so we’re sending him to get that done and to get him checked for the surgical wound he appeared with. We started out at 9.50pm (22 Jan), and called it a night at 11.30ish. Bradley continues to elude efforts to get him but there may be hope. While waiting for V, we met A and her daughter, J, who feeds the cats nightly. A says Bradley usually waits for her behind the eatery at around 8something. We’ll work with her to get him. For interested readers, since we named him, we’ve not been able to find him until last Wednesday. He’s growing up quite well. A has also sighted Stanley recently, and we’re glad to have the confirmation that he’s well since we’ve not seen him since his release. Other interesting bits: A lives in the same block as Saba‘s family, and confirms she has a new litter she’s hiding in the drains somewhere. Scottie has been claimed by the family’s man of the house due to his super sweet nature. Scottie was found with a knife wound to his tail last week and the family has applied medicine. They also have a new white cat with a a fluffy tail which they paid more than $100 to get sterilised voluntarily but is still terribly unwilling to sterilise Saba. They told A they wanted to ask us to help sterilise Saba but can’t contact us as we’ve changed our numbers- which is incredible since both btmao and I have kept the same hp numbers. A has been persuading them to get Saba done, but the same excuses as the ones they used on us were trotted out apparently. They even asked A to sponsor $30… a rather brazen request considering that they now have 2 wall-mounted large LCD TVs, expensive looking wall-mounted sound systems, and even renovated their home for the last Hari Raya. Now that Saba has kittens, she has also been going up to A’s flat to ask for food too! A provides food outside her door. I told A to stop doing that and to feed in common areas with discretion as she would any other cat. I have also requested A not to let the family know she has made contact with us – I am fed up with them and the case with the white cat shows they are more than able to afford and find their own vet. On a related tangent, btmao is trying to handle a complaint. The TC has pictures of a cat which an Area2 resident claims is noisy in the early morning but will not share the picture nor reveal the complainant’s contact details. In frustration, btmao asked the TCO why can’t the complainant then talk to the feeder or the cat’s owner since he is able to take the cat’s pictures. The TCO has no answer except that people don’t take ownership of their own problems. The TCO then said he would call HDB, so btmao reminded him that HDB does not allow pet cats, which means it would result in more cats outside which means more potential problems for him. He then said he might need to talk to the MP, and btmao said fine, we’ll go see him first. To be fair, the TCO is a nice person and he does try to work with us, but this was a conversation that really got nowhere fast. Anyway, from our convo with A today, we believe the cat in question is the family’s white cat as A says it goes into the carpark nearby in the early morning and cries for food. We’ll need to think on how to handle this one. Sally, whom we thought missing or displaced by Saba and the steady stream of later additions to the family is also on A’s floor. A Malay family allows her in to play with their children and shuts her out when they sleep. 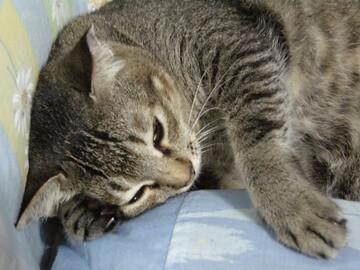 Sunny has died, knocked down at the very busy intersection nearby. The elusive mother cat and second litter we heard about and have yet to locate is most probably Sarsi. Only 1 kitten from her first litter survived, likely kitnapped for its looks. As for her second known and current litter, no one is sure how many there were nor how many are alive now. We shall try to locate her. A new male cat we named Robby has been on the prowl for love. Two nights ago, he was after Brina like a greyhound was on to a hare. He was sitting right by the drains Brina’s family called home as we were about to call it a night, so V set the trap for him. Unfortunately, he was not interested in food at all, and eluded capture this time. We can only hope Brielle will remain safe until Brina’s return on Sunday, and that his lust will subside soon. There is another new male cat we sighted early last month untipped and unsterilised. He then turned up 2 weeks later with a tipped ear and a collar. We call him Jet due to his spraying. From A, we got to know that he belongs to the family’s neighbour. The family DEMANDED Jet be sterilised as he was getting intimate with Saba and they don’t want more kittens. The wonder is that the neighbour complied. The bigger wonder is that the neighbour didn’t demand the family reciprocate with Saba’s sterilisation. We’ve exchanged contact info with A and J and will be sharing more info, esp kitty food info. Details and of course pictures of Brina and her family, Jerry, Jet to come.